Wikipedia is a popular online encyclopedia that can be a good starting point for research on any subject you may be interested in. What Wikipedia sorely needs is a better search engine though. Microsoft Powerset is a search engine technology that is powering Microsoft's own search engine Bing. The Powerset website however is currently being used to demonstrate the Powerset technology by providing a better Wikipedia search experience. The most notable difference becomes apparent on the start page of Powerset. Here it is not only possible to enter specific keywords like Google Chrome or Microsoft, but also questions like "what did Benjamin Franklin invent" or phrases like "impressionist painters". Wikipedia will return a list of possible results for those queries leaving the user with the task to look through them to find the article containing the right information. The results pages that Powerset generates are also distinctively different from Wikipedia pages.Take Caffeine for an example. Wikipedia displays one extensive article about Caffeine that is divided into subsections. Powerset on the other hand begins by displaying the most relevant information about Caffeine (and possible related meanings) at the top. Even more interesting than that is the so called Factz section which are information compiled from various Wikipedia articles. Yes, that is factz, not facts. These facts list the subject, a verb and an object and are listed in rows. For Caffeine its Caffeine (subject) Increases (verb) production effectiveness .. (object) in the first row and Caffeine Causes anxiety .. in the second with a total of 183 rows that can be displayed. Interested users can visit the Powerset website to test the services. Powerset is no longer available as a standalone service. While Microsoft may have added some of the functionality to its Bing search engine, the actual interface that Powerset provided is no longer available. Wikipedia has an article on the Powerset company before it was bought by Microsoft. 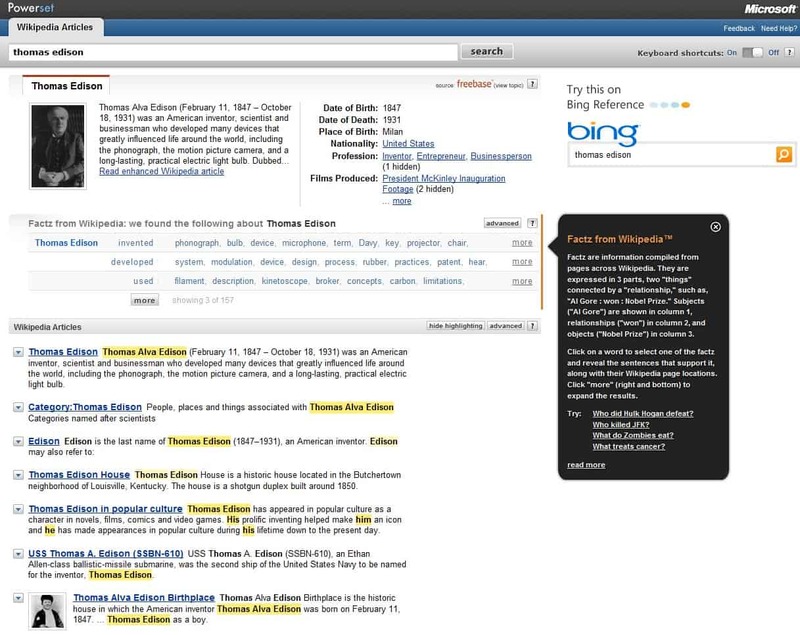 Powerset is a search engine technology that Microsoft acquired for its Bing search engine. A demo of the service was released recently.